AL MVP Mike Trout is advocating for Minor League Umpires at Spring Training by trying to get them more big league experience during the baseball pre-season period. 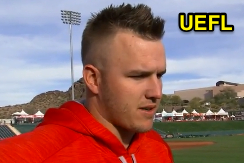 Mike Trout wants more March MiLB umpires. Trout has never been ejected from a Major League game, though coincidentally enough, his manager Mike Scioscia was just ejected by Mike Cascioppo, who is a minor leaguer working his first Spring Training. Unlike the never-ejected Trout, Scioscia has been ejected over 40 times in his playing and managerial career. According to a Buster Olney report, Trout has an idea for pre-season baseball: schedule the MLB staff umpires to, on occasion, officiate just two-thirds of the Spring games and give that remaining one-third of play to minor leaguers that have been left off the Spring Training invitee list. Based on that timesharing program, more younger umpires could gain big league experience, if only for a few innings during Spring Training at a time. HP: MLB Veteran (Innings #1-6), MiLB Non-Invitee (Innings #7-9). 1B: MLB Veteran (Innings #1-6), MiLB Non-Invitee (Innings #7-9). 2B: MLB Veteran (Innings #1-9). 3B: MiLB Spring Training Invitee (Innings #1-9). Whether or not the plate umpire is switched out after six innings of play, swapping base umpires would still afford developing umpires expanded opportunities for exposure that don't yet exist in the Spring. According to one unnamed league source, Trout's idea "makes a lot of sense for a lot of different reasons." For now, though, we have the MiLB Invitee list, which in 2017 includes 26 Triple-A umpires, 12 of whom have previously officiated a regular season MLB game. As is tradition, baseball has also extended the opportunity to a few additional non-invited umpires to officiate the odd late-March pre-season game, although this list is fairly select due to the larger-than-usual MiLB invitee list (due itself to the World Baseball Classic). Click through ("read more") to see the few umpires not on the invitee list who have had a chance to work a game or two in March. Trout's proposal would also require suspension of the rules, as OBR 8.02(d) states, "No umpire may be replaced during a game unless he is injured or becomes ill."